St. Martin's Griffin, 9781250049384, 288pp. 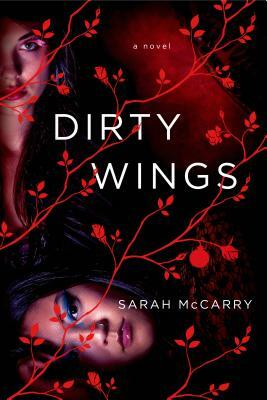 In Dirty Wings by Sarah McCarry, Maia is a teenage piano prodigy and dutiful daughter, imprisoned in the oppressive silence of her adoptive parents' house like a princess in an ivory tower. Cass is a street rat, witch, and runaway, scraping by with her wits and her knack for a five-fingered discount. When a chance encounter brings the two girls together, an unlikely friendship blossoms that will soon change the course of both their lives. Cass springs Maia from the jail of the only world she's ever known, and Maia's only too happy to make a break for it. But Cass didn't reckon on Jason, the hypnotic blue-eyed rocker who'd capture Maia's heart as soon as Cass set her free--and Cass isn't the only one who's noticed Maia's extraordinary gifts. Is Cass strong enough to battle the ancient evil she's unwittingly awakened--or has she walked into a trap that will destroy everything she cares about? In this time, like in any time, love is a dangerous game. Sarah McCarry was born in Seattle. She is the recipient of a MacDowell Colony fellowship and has written for Glamour, The Stranger newspaper, the Huffington Post Books Blog, and Tor.com. She has published essays in Listen Up: Voices from the Next Feminist Generation (Seal Press) and Voices of a New Generation: A Feminist Anthology (Prentice Hall). Since 1999, she’s written and produced the zine Glossolalia; it’s currently in the permanent collections of libraries across the country, including Columbia University, Barnard College, the Multnomah County Public Library, and the San Francisco Public Library. In August of 2009 she started the personal blog www.therejectionist.com. The blog currently has over a thousand followers and gets over 20,000 hits a month. She has bicycled alone across two continents and worked as a domestic violence advocate, a circus performer, a clearcut surveyor, an archivist, and a letterpress printer. She lives in Brooklyn, New York. She is the author of All Our Pretty Songs, Dirty Wings, and About a Girl.